A Palestinian Christian father whose 12-year-old daughter was killed by Israeli soldiers has spoken about the ongoing conflict and his decision to forgive the soldiers who shot her, just over 15 years ago. Violence erupted once again at the weekend along the Israeli border with Gaza, leaving at least 16 Palestinians dead and hundreds injured. For the indigenous Christians who live in the West Bank and Gaza, the disputed areas under Israeli military occupation, there are numerous challenges. Not only are they a small religious minority (less than 2 per cent of the population, according to the Christian charity Open Doors International) among the majority-Muslim (80-85%) Palestinians; the Israeli-Palestinian conflict also causes numerous restrictions from the Israeli side. Because of this many Christians leave. 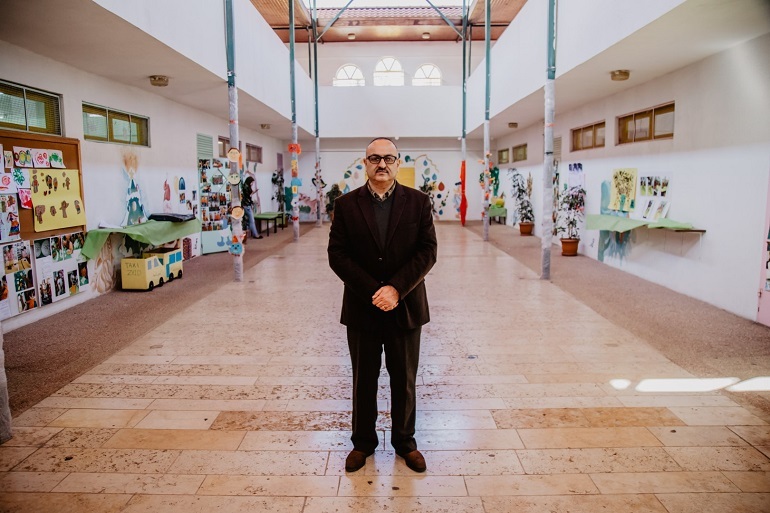 George Saadeh, 56, principal of Shepherd’s High School in Beit Sahour, a Palestinian town east of Bethlehem, says around 30 families have emigrated from his area in the last three years. That decision turned out to be costly. In March 2003, during another Palestinian uprising, the Second Intifada, Israeli soldiers opened fire on their car as they travelled to the supermarket, instantly killing 12-year-old Christine and injuring Saadeh, his wife and other daughter Marian. “Life was dark for us,” he said. Because of his injuries he was not able to attend his daughter’s funeral, but he said that “within all the despair and the deep grief … somehow we found the power to speak words of love and forgiveness, to speak about the strength of Jesus Christ living within us. He is stronger than hatred and injustice”. Saadeh joined a network for Palestinian and Israeli families who lost children through the conflict. “We speak and we share about our bereavement. That has helped me. I have Israeli friends now,” he said. Since the loss of his daughter, Saadeh has started to speak about tolerance, peace, forgiveness and justice. When he addresses groups abroad he sees how people struggle with his message because “it doesn’t fit in their image of the conflict here”, he said. “I tell them: don’t be pro-Palestinian or pro-Israel; be pro-justice”. In his school in Bethlehem which belongs to the Greek Orthodox Church, the largest church in the Palestinian territories, children of all religions are welcome. They receive religious education according to their background: an imam teaches the Muslim students, a priest the Christians. But throughout the whole school programme the Christian identity is present and the life of Jesus is a guiding principle, Saadeh said: “[He] was the first teacher. He showed in his own lifestyle what he preached… I’m talking about: how do you behave? What defines your relationships with others? Treat others with love. Be honest. Play fair in sports. Have respect for those who think differently than you”. The Palestinian Territories are number 36 on the 2018 Open Doors World Watch List of the 50 countries where it is most difficult to live as a Christian. Christians from a Muslim background face particular pressure, mostly from their families, and increasing Islamic radicalisation throughout society makes conversion to Christianity even more dangerous.